The reliable commercial roofing contractors at Veterans National Property Services can perform a variety of municipal roofing services for government properties located throughout the Tampa Bay area. We are a minority-owned and Service-Disabled Veteran-Owned Small Business (SDVOSB) that believes in providing the best roofing services for government projects. Our team of professionally trained roofers can expertly install, replace, or repair roofs with a wide selection of premium products from trustworthy manufacturers, ensuring the property receives a durable upgrade that lasts. Weft-insertion anti-wicking scrim – With a density of 18 by 14 threads per inch, this durable and waterproof roofing membrane will protect government buildings from unpredictable weather conditions. Prefabrication – Duro-Last is the only single-ply roofing on the marketplace to offer prefabrication for your entire roofing system. This results in a customized product that will meet the dimensions of a particular government property. 40, 50, and 60 mil membrane thickness – This municipal roofing product is available in all three thicknesses to meet the specific requirements of a wide variety of properties. 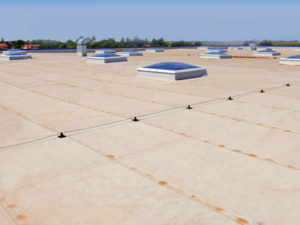 Additionally, Duro-Last requires that our employees complete extensive training, ensuring every municipal roof we install adheres to industry-best techniques. To learn more about VNPS’s municipal roofing services for government buildings in the Tampa Bay area, contact us today.